Central Working, the leading shared workplace provider, asked us to design a new members’ club in Reading. The brief was to create a distinct identity for the location while retaining a similar feel to Central Working Victoria, the hugely popular shared offices we designed at Eccleston Yards in London. The site was a blank canvas. Unlike Central Working Victoria's heritage building, the Reading location was a new build; a neutral backdrop ready for an injection of personality. We conceived the concept 'City Meets Nature' to meet the challenge, breathing life and identity into the space. The concept is highly fitting for the location – Reading is very green, and you can get to Central London in under 30 minutes – underscoring the idea of digital nomads and freedom. Hosting a start-up community of entrepreneurs, the space houses up to 280 members over 16,000 sq ft. We evolved the colour palette established at Victoria, moving towards natural and earthy tones; a spectrum of greens, ochre and terracotta oranges, warm browns and green-greys. Contemporary floral and botanical wallpaper is used as a feature in welcome and social spaces, while blocky, abstract cityscape wallpaper is used as a powerful background in meeting rooms. Homely touches like greenery, clay pots and wicker baskets soften and complete the aesthetic. The club has a stylish, considered mix of contemporary furnishings, with hardworking office furniture appearing alongside modern design classics. Encapsulating Central Working’s hospitality-led approach, the coworking hub includes a dressing room and a chill out room where members can relax or even sleep. 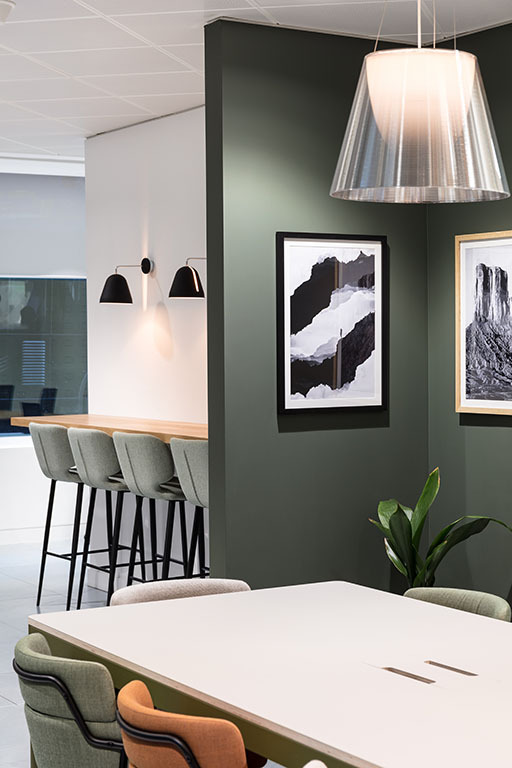 Following the creative strategy that we developed for Central Working’s interiors, we divided the vast space into a range of adaptable, interesting work areas that champion collaboration. Using the same spatial planning principles for each club creates a subtle level of consistency across each Central Working site, while avoiding an overly uniform or corporate feel. We thought carefully about how members would circulate through the building. Instead of the long corridors typically associated with offices, we created unexpected niches and ‘hideaways’ to foster a sense of serendipity. There are meeting rooms, private offices, breakout areas, kitchens, lounges and dining areas, an agora room and an auditorium for talks and networking events. Stylists Studiolav interpreted our City Meets Nature concept with the theme of natural co-habitation – a vision of the future where humans exist harmoniously with their surroundings. Custom-made installations draw from natural motifs, suggesting a return to indigenous crafts like weaving and mask-making.